Morelian Gazpacho, an authentic Mexican fruit salad often sold by street vendors in plastic cups. photo (c) loppear, creative commons license cc by 2.0. 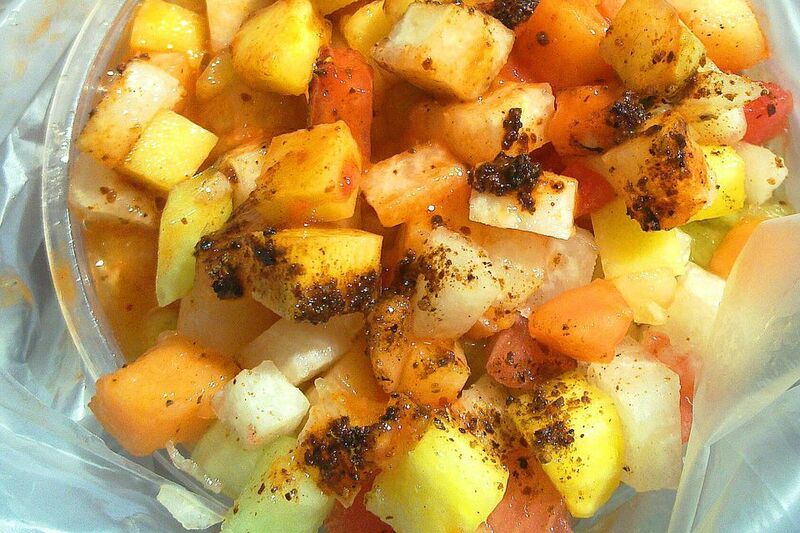 Morelia, the capital of the central Mexican state of Michoacán, has developed a distinct version of pico de gallo fruit salad. Though it shares a name with a Spanish dish, it is nothing like the cold tomato-based soup we generally associate with the term gazpacho. If it’s a hot day, your body’s going to crave this, so please give it a try. *Do not use "chili powder" (spice blend intended for making chili soup) in this, as that product contains other seasonings that don't fit in with the flavors here. All the fruit should be fresh (not canned) except for maybe the pineapple, which could be canned if fresh is not available. Chop it all into small cubes of roughly the same size – no larger than, say, half an inch in size. Put all the chopped fruit into a large bowl and squeeze all the juice from the limes over it. Dice the onion as small as you can – we want it to add it as a flavor element to this dish without its being noticeable as an ingredient. Add onion to the bowl of fruit, together with the salt, ground hot pepper and/or black pepper, cheese, and orange juice. Dish into bowls or, for the street food effect, transparent disposable cups. Offer additional ground hot pepper and/or bottled hot sauce for those who wish to zip up their gazpachos even more. Serve with a spoon. Include cucumber (without seeds) and/or cantaloupe in the mix of fruit, in place of or in addition to those listed in the main recipe. Omit the ground hot pepper and use fresh instead: dice a seeded and deveined jalapeño pepper as finely as you can and mix it in. For an additional tart note, stir in a tablespoon or so of vinegar in addition to the lime juice.